Spring has arrived. The days are getting longer and lighter, and in the spring a young distance kayaker’s fancy turns to… getting out on the water for a long paddle! On previous weekends, we’d explored the Gowanus Canal and Newtown Creek—both delightful trips, but at 5-6 hours, a bit on the short side. This weekend Vlad and I had promised ourselves a good long trip, to start getting in shape for the summer’s racing and expedition season. The tricky part was figuring out where to go. The current was running south, with slack at the Verrazano Narrows around noon. That meant we’d need to go south in the morning. But where to? Sandy Hook, with its long stretch of open water? 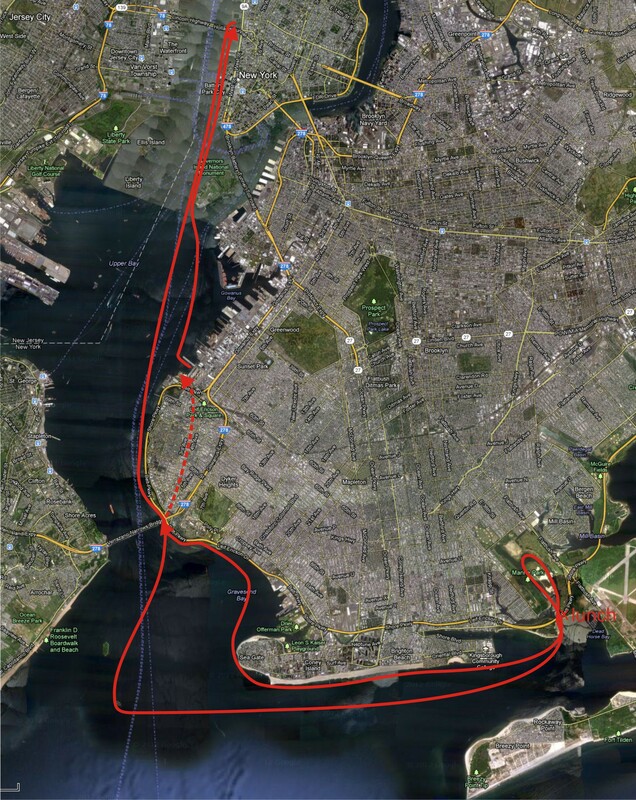 A 12-hour Staten Island circumnavigation? They both seemed just a bit too daunting for the first serious paddle of the season. 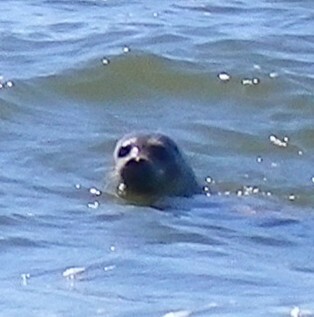 We finally decided on a trip to Rockaway Inlet (the entrance to Jamaica Bay), with a side-trip on the way down to see the seals at Swinburne Island. We’d be following the shoreline, so no risk of capsizing out at sea. And unlike with a circumnavigation, we could turn around at any point. In retrospect, we should have known better. For whatever reason, trips to Coney Island and beyond always seem to involve an extra helping of, shall we say, excitement. On my first trip to Jamaica Bay, we paddled too slowly and missed the current on the way home. The trip ended up taking 17 hours, including a grueling stretch where I battled the “wind” (in reality, a relatively modest 10-kt breeze) across Gravesend Bay. More recently, on separate trips home from Coney Island, we had one paddler nearly pass out from low blood sugar, and another get a painful and lingering wrist injury. So it’s not as though these southerly trips have ever been as incident-free as we imagine. But what the heck! It’s spring, the sun is sparkling, and the green-gold water beckons. Coney Island! Breezy Point! What’s not to love? We start later than planned—8:40 instead of 8:00 AM. But with the strong ebb current and a gusty wind from the north, we’re soon rocketing south at 7-8 knots. The temperature’s cool but comfortable—around 40-45 degrees—with an overnight low predicted around 27. But we’ll be back well before then! The wind’s predicted to pick up—maybe to 10-15 knots by late afternoon—but nothing unmanageable. After what seems like only a few minutes we’re just north of the Verrazano Bridge. Sunlight is all around us, dancing off the waves. But what’s that? Vlad notices something in the water, something dark, shiny, and clearly alive. It’s a harbor porpoise, arcing out of the water in slow, sinuous loops. When I first catch sight of it, it takes my breath away, it’s so graceful. And it seems to be entirely aware of us, almost flirtatiously flitting from one side of our boats to another. Sometimes it seems to be peeking at us. At one point, I swear, it chirps at me—a squeaky sound like a rusty hinge. And when it surfaces close by, I can hear the sound of hard breathing through the blowhole, like a racer gasping for air. It stays with us all the way down to the Verrazano Bridge, surfacing first on one side of our boats, then the other. Its movements are predictable: It surfaces once, does three quick arcs, then disappears for a while, reappearing somewhere else. Just before we go under the bridge, I decide to take a pit stop on the Brooklyn side of the bridge at Fort Hamilton. There’s a nice secluded sandy beach that makes a great place to stop for bio-breaks and other emergencies (so long as you can avoid observation). It’s also the place I stopped after the grueling paddle home from Jamaica Bay that first time. 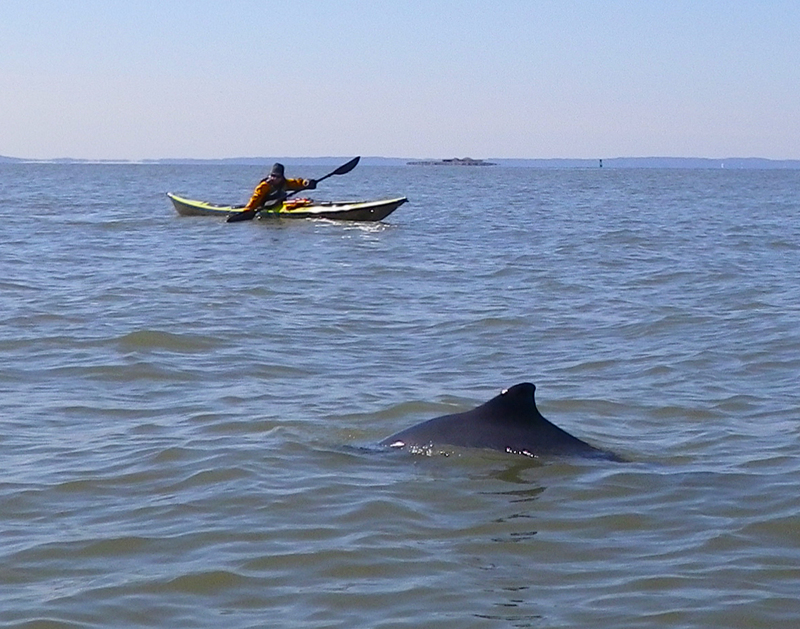 Amazingly, when we resume paddling, we find that the porpoise has stayed with us. He frolics around the boats until well south of the bridge, nearly all the way to Swinburne Island. Then he takes a last dive and disappears to parts unknown. We hope to see him again! At Swinburne Island, we paddle slowly, hoping to catch sight of some seals. We aren’t disappointed—about 20 heads pop up, round gray basketballs with black shiny eyes. They swim close, sometimes cocking their heads quizzically, then disappearing in a flurry under the water. We spend quite a while observing (and being observed by) them. The morning has mellowed out into a pleasant day by the time we veer east. It’s warm and sunny, and the breeze at our backs doesn’t feel particularly strong. But we’re making great time, following the coastline of Coney Island. We’re staying well out to sea to try and catch the dying ebb current. Our destination is somewhat randomly chosen: Brooklyn Marine Park, just before the entrance to Jamaica Bay, where on the chart it looks like there’s an interesting island in the middle of an inlet. Neither of have been there, and we’re interested in seeing it. By the time we get there, the current has begun to change, and our progress is slowing. As we turn north into the inlet, the breeze that’s been behind and to the side of us picks up and becomes a series of powerful gusts. We slow down still further, until we’re making barely 2-3 miles per hour. But it’s okay: we’ll only be paddling against the wind for a little while, until we turn left again to circumnavigate the island. As we paddle through the inlet we see interesting sights: A flock of noisy Canadian geese, which protest our approach mightily. A fenced-in field that looks like it’s draped in long strands of glitter, which Vlad promptly dubs a “confetti farm”. (We figure out later that the glittery stuff is designed to keep the geese away.) And finally, a pair of swans. We give them a wide berth: Swans are beautiful but mean. As we paddle around the island, the wind picks up still further, until it feels like a sustained blast against us. This isn’t too bad, except for one thing: It’s coming from the direction we’ll need to paddle in to head home. We both try to ignore this thought. Que sera, sera—right? But with the beach at our back, and the water ahead, it’s actually quite a nice view, despite the name. And it’s the first time all winter that it’s been warm enough that we can get out of the boats for a meal. Heading back west, we stay close to the Brooklyn shoreline on our right. We pass the rocks where several of us did our Storm Gathering training. I have a flashback to Reid and me practicing how to land and launch from surf-battered rocks. My sunny yellow Photon got all scratched up then, but it was worth it. I wonder idly if I’m ever going to need that knowledge—maybe someday in the far-distant future when I go kayaking in Wales or Scotland? Then we settle in for the long slow slog past Manhattan Beach… Little Odessa .. and Coney Island. Our progress is pretty good, but I have two nagging worries. First is the pace: We’re going slowly, around 2-3 mph, which tells us we’re already losing the flood current that we were counting on to take us home. The current will soon be against us, and is only going to get worse with time. And second, even though the wind isn’t too bad, when the skeg is up my boat’s nose turns consistently to the right, to the north. For you non-kayakers, the skeg is an adjustable fin that can be tucked into the boat, dropped into the water, or positioned anywhere in between. When the skeg is up, tucked into the boat, and a strong wind is blowing, the boat will tend to weathercock—point its nose in the direction of the wind. You have to drop the skeg to make the boat straighten out. So the fact that my boat keeps weathercocking to the right means there’s a strong wind from the north—which is where we’re headed. But still, we’re able to sustain a pretty steady pace. The first real trouble hits when we’re rounding the bend at Seagate, at the western tip of Coney Island. As we turn into the wind, our pace drops—first down to 2 mph, then down to 1.9, 1.8, 1.7… Vlad pulls ahead, as he’s a stronger paddler, and his Feathercraft is heavier and therefore less susceptible to the wind. I straighten up and focus on form: Torso rotation, making a “bowtie” with the paddles, crisply finishing the stroke. Despite my best efforts, though, I keep slowing down. 1.0…. 0.8… 0.6. Crap! At one point I’m reduced to 0.2 mph forward. Two tenths of a mile per hour… I’m barely moving. And yet I’m paddling all-out! Of course, on some level it doesn’t really matter how slowly you move forward, so long as you do continue to move forward. The issue, though, is that both the current and the wind are predicted to get worse from here. And if they’re already so strong that forward progress is glacial, there’s a possibility for real trouble later on. And we’re still around 12 miles from home. That’s not even factoring in fatigue. I have a lot of stamina, but we’ve already been paddling for 8 or 9 hours now. But there’s nothing to do but put my worries out of my head, and keep paddling. After a bit I make it around the point. Vlad is waiting for me, and I’m pleased to see I can pick up my previous pace—nothing to write home about, but 2-3 mph. Next up: Crossing Gravesend Bay. I’m having uncomfortable flashbacks to my Jamaica Bay excursion—the time I found myself trapped by the wind and current in Gravesend Bay, unable to move the boat forward at all. But fortunately, this time it’s pretty uneventful. The wind has settled down to a low persistent howl and the current is clearly against us, but we’re making slow and steady progress. It takes about an hour to cross the bay, and the sun is sinking low by the time we approach the far side. 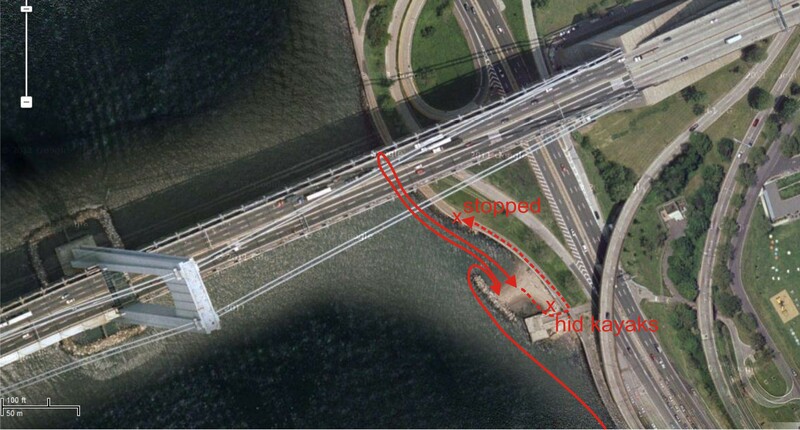 Once we’ve finished the crossing, the next step is the bend at Fort Hamilton, right before the Verrazano Bridge. We haven’t really discussed it, but since darkness is approaching, the goal is clearly to stop at the little beach, put on lights, and assess how things are going. We creep along the northern side of Gravesend Bay, preparing to nose out into the full force of the current and wind. Inside the bay we’ve been pretty sheltered from both. Once we get out into the main channel, we’ll be able to gauge how bad things are. As we paddle right around the bend, I get a nasty shock: I’m putting everything into my strokes, and I’m making NO progress against the escalating wind and current. This is a paddler’s nightmare: Paddling as hard as possible, and getting blown backwards regardless. Normally I’d stick close to the shore to minimize the effect of the current, but this wind won’t let me—if I get too close to the shore, the wind will dash me into the rocks. Vlad is paddling hard, and slowly pulls ahead of me. I find that every now and then the wind lets up enough for me to make some progress, but I’m measuring it by yards. Feet. Inches! And there are long stretches of time during which I’m working as hard as I can, but not moving at all. The sun slowly sets behind the western tower of the Verrazano Bridge, and darkness sets in. My lights are mounted, but there’s no way for me to turn them on. Vlad is ahead of me. He’s landed on the beach. I can see the yellow flash of his drysuit. I keep paddling for what feels like an eternity, but probably is only 15 minutes or so. Finally I pull up next to the beach, and make the sharp angle almost backwards to begin the approach. The wind and current catch me. Foaming, surging, boiling waves drive me onto the beach. I barely remember in time to navigate between the sawed-off pilings to the right, and the pile of rocks to the left. The water lifts me and slams me onto the beach. I yank the spray skirt and struggle out of the boat, thinking I need to turn on the lights. But a primal drive grips me: I must get out of this wind. All I can think of is the cold and the need for shelter. I clamber up the beach and onto the cement structure behind it. I can see in the dim light that it’s kind of a decayed pier, with three square tunnels underneath and a low wall on top, behind which I take shelter. Being out of the wind helps some, but as Vlad comes over to see what’s up, I get another nasty shock: I’m shivering uncontrollably. I mean, I’ve been cold before, but this is something different. It’s bone-deep and powerful. And I remember from my cold-water training that uncontrollable shivering is the first step towards becoming hypothermic. The next phase is when your judgment starts to go. Once that happens, all bets are off—you can’t count on yourself to stay safe. Vlad comes over and asks what’s wrong. I tell him: “I’m shivering uncontrollably.” His eyes widen a little—he knows what I’m saying. We discuss the situation briefly, but really, there’s no discussion: The goal at this point is to warm me up, hopefully to a point where I can start paddling again. If we can’t do that, it’s time to call 911. I instruct Vlad about the emergency bivvy sack I’ve got stored in my drysack in the day hatch, and the nylon tarp in my other hatch. (I later find out that Vlad has not one but two of the emergency bivvy sacks himself—plus nylon pants and a jacket that fit over the drysuit and PFD). We wrap me up, and he pours me some hot tea. Flashback to the day we practiced cold weather rescues with Warren: he made 9 or 10 of us get into an emergency tent together, to show us how quickly these tents can warm up. Then he solemnly warned us to get emergency cover gear. I bought mine the next week. I’d been carrying it in the bottom of my first aid kit for a couple of years, secretly doubting I’d ever need it. It’s like that tire iron and blanket you carry dutifully in your car—you never believe you’ll actually use it. That’s not the only thing I’m glad of: I also have the extra Snickers bar, and the rest of the hot tea. I remember Warren explaining that sugar helps combat hypothermia. And as the warmth creeps into my arms and legs, and little by little I stop shivering, I can see that he’s right. Slowly the feeling returns to my fingers and toes. I’m warming up, I really am! No need to call 911. But we have to figure out what to do next. Unfortunately, the options are limited. The current against us is still increasing, and the wind shows no signs of slowing down. We later estimate that it’s blowing 20-25 knots. We can try push on, with the risk that the wind will pick up even more and make further progress impossible. We can wait it out: by now it’s around 8 PM, and the current will begin to lessen around 9:30 or so, although it won’t change direction until around midnight. And of course, who knows what the wind will do? Or we can bail: Hide the kayaks as well as we can, catch a cab home, and come back tomorrow afternoon, when the current will have turned, to finish the trip. After a bit of discussion, we decide to press on. The hot tea is gone, and even with extra clothing and emergency cover, we’re beginning to get chilly again. So the idea of waiting the current out is probably a non-starter. We’ll both be hypothermic by the time the conditions have improved. The nice thing about pushing on is that if we can’t make it, we’re no worse off than we are now. We agree that if the current and wind are too strong, we’ll retreat back to the beach and default to the last option: Hiding the kayaks and catching a cab. So we’re decided. We pack up the boats, turn on the lights, and launch into the churning, boiling froth. Almost immediately, it hits again. The wind has picked up even more—now it’s whistling past our ears to the point where we can’t hear each other. And the current is roaring down against us. It feels like trying to head upriver on whitewater. Vlad is slowly pulling ahead of me, very slowly. Every now and then he stops to look back—and the instant he stops paddling he’s swept backwards. After a while, I realize that we’re not making any progress. None. I’m seeing the same landmarks, over and over. I’ll make it a few yards—then the wind will pick up, and I’m blown backwards to my starting point. We keep hammering away for a while, hoping things might get better. But if anything, they’re worse. I’ve crawled along the same few yards of the bridge pier four or five times in the past 20 minutes. There really isn’t anything else to do at this point. I can’t remember if we shouted to each other, or just made it clear with body language. But there’s no way we’re going forward—we have to go back. We turn the boats and the wind slams into us from behind, shoving us along so violently we almost miss the little beach. Once more, I navigate between the pilings and the rock pile, and crash land on to the beach. Vlad slams into the sand beside me and we’ve landed. This time, there’s no discussion or debate. Vlad turns on his flashlight, and working quickly to stay warm, we strip the boats of valuables. I grab my compass and GPS and stuff them into my drybag. The paddlefloat and pump go into the cockpit—who’s going to steal a kayak pump?—along with the spare paddle. Everything else goes into another drybag. And I grab the main paddle to come with me. From somewhere, Vlad extracts a giant rubber dufflebag and stuffs his gear inside. There’s room for my stuff, too. I throw in my sprayskirt, and think about adding the PFD. I’m worried about walking the streets of Brooklyn with the knife on my PFD. It’s only a couple of inches long, but it’s sharp as hell—and illegal on the streets of New York. I have a friend who was stopped by the police for carrying a knife. He spent a night in Rikers. But I ultimately decide to keep the PFD (and the knife) on. It’s cold, and I can use the extra warmth. Besides… what are the odds of getting stopped by the cops? It’s 9 PM. All we want to do is hail a cab and get the heck out of here. Once the kayaks are stripped, we haul them into one of the tunnels under the concrete pier. It’s the leftmost one, the smallest. And the driest—so our kayaks are unlikely to be swept away by the tide. I’m smaller, so I go in first. It’s a good thing neither of us is claustrophobic, because after a few steps, I can’t stand up. I’m bent almost double carrying the front of the kayak, and even so my head keeps smacking into the concrete ceiling. Vlad can’t stand at all—he’s scrambling on all fours. But we’re able to hide the kayaks well. From a few feet outside the tunnel, you can’t see them at all. We’re proud of ourselves—it never occurs to us that having the boats this well hidden could turn out to be a bit of a mistake. Next up: Climbing the metal fence onto the street. The fence is about 8 feet high, rusted and topped with spikes. Fortunately it’s relatively easy to clamber up, but a bit nerve-wracking, too—one misstep could do some serious damage to a drysuit (not to mention the person inside). But soon we’re over the fence and walking down what turns out to be a bike path along the shore. We’re not entirely sure where we’re headed, but Vlad thinks he remembers an overpass. Maybe there will be taxis there. We’ve only walked for a minute or two when we see bright lights coming towards us. A car? On a bike path? It pulls up to us, and what do you know: It’s a blue-and-white police car. Followed by another one. And a third. And a fourth. I’m sure we make quite the sight in our drysuits and PFDs, me with my paddle and Vlad with his giant rubber duffel. But four squad cars? The officers get out of the car and crowd around us. What are we doing here? We explain. The officers shine their lights into the darkness. All they can see is whirling white water. No kayaks. Of course not—they’re farther down the path, and well-hidden besides. I catch a couple of skeptical glances—kayaks? This time of night? In 20-degree weather? One of the officers—a young man named Officer DaVecchia—looks at me and says suddenly, “Hey, is that a knife?” I allow that it is: “It’s for cutting fishing lines.” “I can see that would be useful,” he says. “But I need you to give it to me.” He disappears into his car. My stomach sinks. I really, really don’t want to spend the night in Rikers. But that’s the least of our worries. Apparently the beach where we’ve landed is Army property—we’re trespassing. Not to mention the fact that we’re not supposed to be in the park at night. And of course there’s the fact that the beach is right under a structure that, since 9/11, the authorities have been somewhat sensitive about—the Verrazano Bridge, which towers over us in the darkness as we stand on the bike path. I explain that we had no intention of doing any of this—that we’d been stopped by the wind and the current. The officers nod. They ask what we plan to do. We explain about catching a cab, returning tomorrow, and paddling home. Apparently that’s no longer an option. Now that the police are aware of them, the kayaks can’t be left where they are. They have to be moved. But where? We insist repeatedly we don’t have a car, or any means of transporting them. Obviously we could rent or borrow something later on—but we really, really hope they’ll just let us continue with the plan. No such luck—the kayaks have to be moved. A group discussion ensues among the officers, from which we’re pointedly excluded. One officer keeps calling them “canoes”. But I’m not too upset: Officer DaVecchia calls me over to his car, gives me a little lecture, and hands back the knife. Things are looking up. Apparently I’m not going to Rikers after all! One of the cars leaves. Just before driving away, the officer rolls down the window and gives us instructions on where to find a cab. Maybe we’ll be released soon? Not quite yet. There’s still the question of what to do with the kayaks. Another officer tells us, “You’re going to be here a while.” We nod. More discussion. Then they appear to have arrived at a solution: They will take the kayaks someplace called “Harbor Charlie”, which is on the water. Presumably we can launch them there tomorrow. This sounds like a great solution. Of course, we have no idea where Harbor Charlie is. All we know is that it’s operated by the harbor police, which is a different group than the officers who picked us up. We repeat, gesturing for emphasis. Everyone looks a bit startled, the group discussion reconvenes. More time goes by. It’s been an hour and a half since we first climbed the fence—so about 10:30 PM by now. The wind has been blowing nonstop, and I’m cold. We’ve dumped our gear by the side of the path, and I tuck my hands inside the PFD. After a while one of the officers notices we’re shivering, and puts us into the back seat of a car—the one with Officer DaVecchia and his partner, Shawanda, who seem to be enjoying the change of pace. I’ve never been in a squad car before. It has about six inches of knee room, so I’m sitting sideways. I’m not sure how Vlad manages. But we’re so happy to be out of the wind that we have no complaints. Why am I speculating about terrorism from the back seat of a squad car?!? Fortunately, everyone just laughs. We chit-chat a bit, and Shawanda turns on the radio. So we’re listening to soft rock behind the cackle of the police radio. Then the other officers ask us to show them the kayaks. We lead a procession back down the path to the beach. But even though the concrete pier shows up in the police officers’ flashlights, the kayaks are too well hidden. A police boat arrives and cruises back and forth just off the beach. Vlad climbs back over the fence to be ready to point out the kayaks. Officer DaVecchia inspects the fence and declines to go over. “Too much gear,” he explains, gesturing at his gun belt. I’m thinking he’s probably calculating that it’s not a great idea to go into the dark with a strange guy—neuroscientist or no. But it’s useless anyway—the kayaks can’t even be seen in the tunnel, and there’s no place for the police boat to land. We go back into the squad car while the police try to figure out what to do next. After about 20 minutes a couple of emergency trucks show up. One’s huge—maybe 25 feet long. The other is smaller. This time, Vlad doesn’t climb over the fence. He just directs the officers. These guys are from yet a third group of police officers, not the harbor police or the first group that stopped us. They rig a ladder over the seawall and descend to the beach. We’ve clearly arrived at the highlight of the evening. All the cops are lined up along the top of the seawall to watch the kayak extraction. The officers below crouch down and head into the tunnel. In a minute one emerges, dragging my little Photon by one end. The other end bounces against the rocks. The police do an impressive job hoisting the kayaks over the seawall. The next step in the drama: How to transport them? First, they try to put them into the larger of the two trucks. I’m not sure why, but the boats don’t seem to fit. After another 20 minutes or so, the team decides to clamp them on top of the smaller truck. Within a few minutes, both boats are clamped on the truck. I think about all the loose gear inside the cockpits—paddles, water bottles—then decide not to worry. At this point, we’ll be lucky if we get the boats themselves back undamaged. We grab our gear and get back into the squad car, and at long last leave the park. It’s about 11:30 PM at this point. 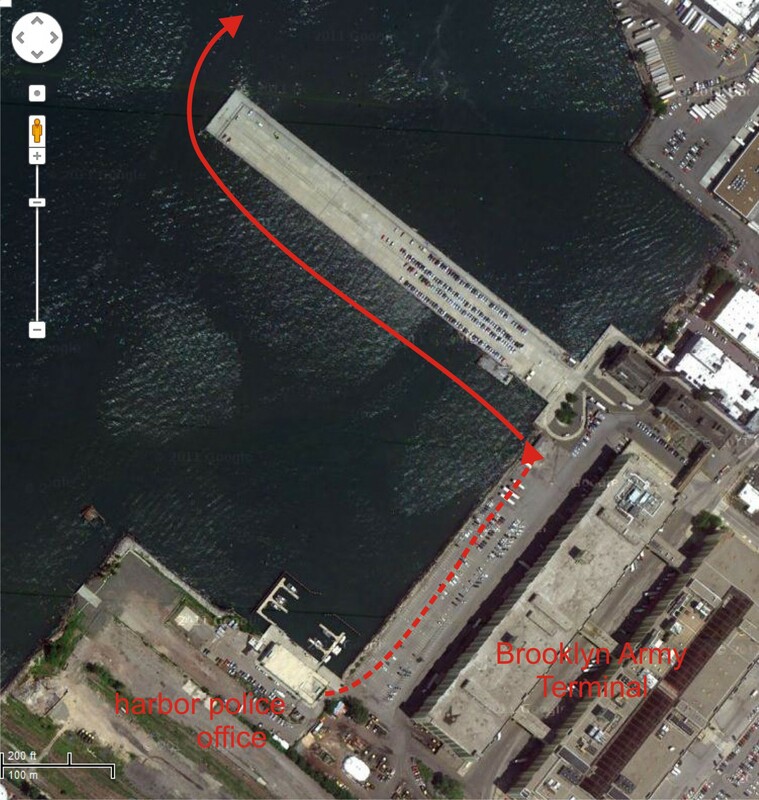 We drive to the entrance of the Brooklyn Army Terminal, which is where the Harbor Unit is. “Harbor Charlie”. That’s where the kayaks will be stored. A minute or two after us, the small truck shows up, emergency lights flashing, with the boats on top. It disappears into the Brooklyn Army Terminal. Now what? Shawanda and Officer DaVecchia are a bit confused about what to do next. They decide to drop us off at the precinct police station, about a mile away. They leave us in the parking lot and drive off. We look at each other and start up the steps, a bit uncertainly. We open the glass doors and step inside, where there’s a generously-tattooed woman sitting behind a low, battered partition. She seems to be taking a complaint from a thin, pale, dark-haired woman. When they see us, both women fall silent and stare at us in our drysuits. Oh boy, where do we start? Fortunately, one of the officers from earlier in the evening shows up, together with Officer DaVecchia. They give us the number of the Brooklyn Army Terminal and tell us to come by tomorrow afternoon and pick up the boats. The officer impresses on us that it’s very important for us to pick up the boats then—they can’t keep them longer than overnight. Apparently it’s highly irregular for them to be doing this at all. I ask about paperwork. How will the folks at Harbor Charlie know it’s us? Then he hands us the number of a cab company and says goodnight. We’re free to go. It’s around 12:30 AM at this point. 30 minutes later we’re on the Upper East Side. The next morning, I call the Brooklyn Army Terminal to confirm the pickup of our stuff. I speak to a friendly-sounding Officer O’Reilly who advises we need to stop by the station first to pick up some paperwork. I call the station only to discover that they have no record of us or our boats. I report this back to the officer at the Brooklyn Army Terminal, who promises to call the station on our behalf. Meanwhile, we decide to think optimistically. We head down to the Brooklyn Army Terminal all suited up in our drysuits, hoping against hope they’ll let us paddle home. It’s sunny and a bit warmer, but still quite windy. It takes us a little while to find the harbor police office, but when we do, we’re heartened: It’s a small building at one end of a seawalled embayment, with a series of low, lovely wooden docks—perfect for launching kayaks! When we arrive, we find that true to his word, Officer O’Reilly has sorted everything out. The kayaks are here. We just need to produce photo ID, sign some paperwork, and we’re on our way. He stares at me intently. I have the feeling he’s trying to tell me something more, but I can’t figure out what. And I’m confused: Last night, the police went to a lot of trouble to get our boats someplace on the water—so we could paddle home. Now they aren’t letting us launch? I ask rather plaintively, “So what do we do?” There’s some back-and-forth discussion about U-hauls, rental trailers, etc. None of the options are appealing. Officer O’Reilly repeats, firmly, that he absolutely cannot allow us to launch from the police pier. Now I get it. What they’re telling us is to take the boats and launch from anywhere—just not police property. We tell them we’d like to take a quick walk and think about it. Outside, we quickly spot the kayaks themselves. They’re stored in an ultra-high-security location: Neatly laid out on the sidewalk behind the harbor police office. As we approach, a black-and-white cat leaps up from the cockpit where he was warming himself and scurries off. Amazingly, not only are the kayaks fine, but we haven’t lost any of the gear in the cockpits. Even the spare paddles and water bottles made it. Next question: Where to launch? We walk out beyond the police compound, through what looks like a large, commercial parking lot, along the seawall of the embayment. The seawall is topped by a long metal fence, solid, about chest high—easy enough to hoist a kayak over. What’s beyond it is the problem: The seawall is built from jagged rocks that lead at a sharp angle down to the water. And it’s facing due west—the direction from which the wind is gusting—probably around 20-25 knots again, judging from the chop. A relentless procession of 2-3 foot waves crashes into the rocks. This would be a very messy launch, with the risk of getting dashed against the rocks. But what’s the alternative? Try to rent a 20-foot U-haul? Borrow a car? Neither seems viable on such short notice. Then we notice a square wooden pallet washed up on the rocks. With a little effort, we could construct our own dock. Maybe this is doable. And after all, it’s exactly the scenario we trained for during Storm Gathering. We decide to go for it. Back at the harbor police office, we inform Officer O’Reilly that we’ve sorted everything out. He’s about to go off duty—he’s already changed into a sweatshirt and jeans. And he pointedly asks no questions. We sign the paper, take a copy, and we’re done. Another uniformed officer volunteers to take us out to our boats. We thank Officer O’Reilly profusely, and leave. As we walk out to the boats, the other officer says, “If it was up to me, I’d’ve let you guys launch from here. But all the big bosses are in today.” We assure him we understand completely. We grab the boats and haul them down to the end of the parking lot, to the spot we found earlier. We’re shielded from direct view of the police building by a row of cars and an 18-wheeler. I launch first, a seal launch from the improvised wooden platform. Vlad stabilizes the platform as I wait for a break in the waves. I push off backwards into the waves… and capsize. As soon as I go over I realize the water’s too shallow to roll. I’m lucky I don’t hit my head on the rocks. I wet exit, jump back into the boat, and paddle out into the waves. I pump out my cockpit while Vlad launches. Ten minutes later, we’re ready to go. The sun is shining, the wind is brisk… and best of all, we have the current with us. So even though we’re paddling into the wind, we’re making decent progress—3 to 3.5 mph. The waves are pretty fierce—they’re up to my shoulders, which means 2 to 3 feet. And since it’s the middle of Monday afternoon rush hour, there’s a fair amount of ferry traffic. But it’s daytime, and the temperature is in the forties. All in all, it’s a substantial improvement over last night. We play tag with the Staten Island ferry just north of Governors Island, and do a bit more ferry-dodging around the North Cove ferry terminal in the Hudson. We arrive into Pier 40 just as the sun’s beginning to set—and we’re greeted by a flotilla of brightly-painted rowboats manned by happily-shouting youngsters. Apparently Floating the Apple has started its season. It feels like a celebration. So, what did we learn? First and foremost, that it’s a pleasure and joy to live in a city where the police can treat its citizens like human beings. Secondly, that it’s a good thing to pay attention to safety drills and best practices—like what to carry, where the next emergency landing point is, and how to launch in conditions. I don’t think we were ever in any real danger, but having the emergency warm-up gear made the difference between going hypothermic and staying functional. And having practiced launching from a rocky shore for Storm Gathering gave me the comfort level that I could do it. Our plan of stashing the kayaks until the next day actually would have worked out quite well, if we hadn’t been caught by the police. Of the options we had available at that point, it was clearly the best one. Continuing to push on could have gotten us into real trouble. If one of us—likely me—had capsized in the dark, the repercussions would have been serious. And neither of us would have been able to wait out the change in currents without going hypothermic. If we’d been outside an urban environment, we’d have been carrying camping gear, including a stove—which, come to think of it, might have been useful even here, assuming the police hadn’t caught us. In retrospect, the main thing I’d have done differently would have been to carry ID, a credit card, and more cash—which I will do from now on. And as weird as it sounds, the whole experience—from start to finish—was a complete and total blast. Even standing in the cold worrying about going to Rikers was, in an odd way, entertaining. It’s great to be an urban paddler! 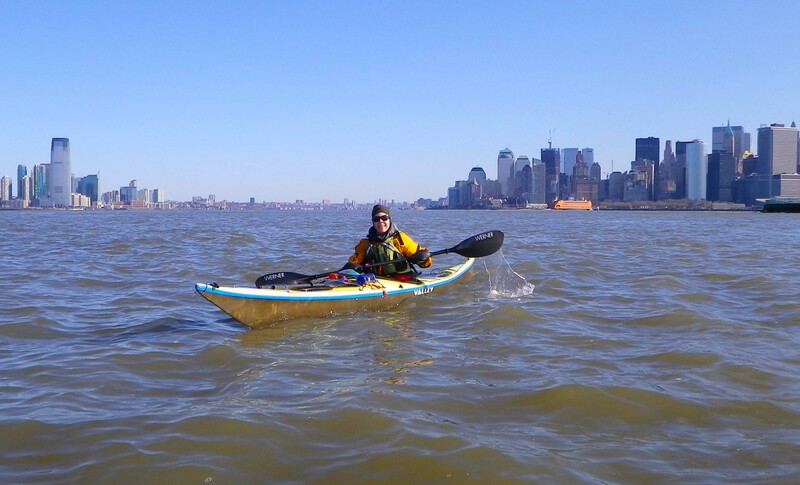 This entry was posted in Kayaking, New York City and tagged Brooklyn, Hypothermia, Kayaking, Marine Mammals, New York City, New York Harbor, Police, Porpoise, Seal, Tidal Current, Verrazano Narrows Bridge, Wind. Bookmark the permalink. The cops were FANTASTIC. I mean, really, we were a colossal pain in their butts–and they went out of their way to be cool. Thanks for reading! Thanks for the windmapper link! Excellent entry — informative and amusing, both attributable to candor. Thank you. I should also note that this is a rousing endorsement for folding kayaking in the big city. If both boats were good to go in backpacks, I suspect you’d have taken the subway home long before things got woolly. Yeah, Vlad’s kayak is nominally fold-able. Ha! But yes, having a truly folding kayak at that point would have been A-number-one peachy-keen. You should write a novel, I was riveted waiting for the outcome of this adventure. Great post! Marcia–Thank you SO much! You made my day, literally! Vlad–You win! (I bet Vlad that nobody would read it because it’s “only boring old text, no pretty pictures, and who’s going to care about THAT?”) So happy Marcia proved Vlad right and me wrong! LOL, I almost skipped reading it when I saw how long it was, but could not put it down once I started. It was really a good post, besides I have a soft heart for NY stories. Well, in a way, it was the high point, the positive one anyway. Still, these are the tales that we tell forever – better to have an adventure than not. I’ve had a few and treasure them all. But actually, as Johna says, they were all high points, one after another—kind of as in a serial thriller, there’s always a cliffhanger at the end of each installment…. Beautifully written – thanks, very enjoyable to read. 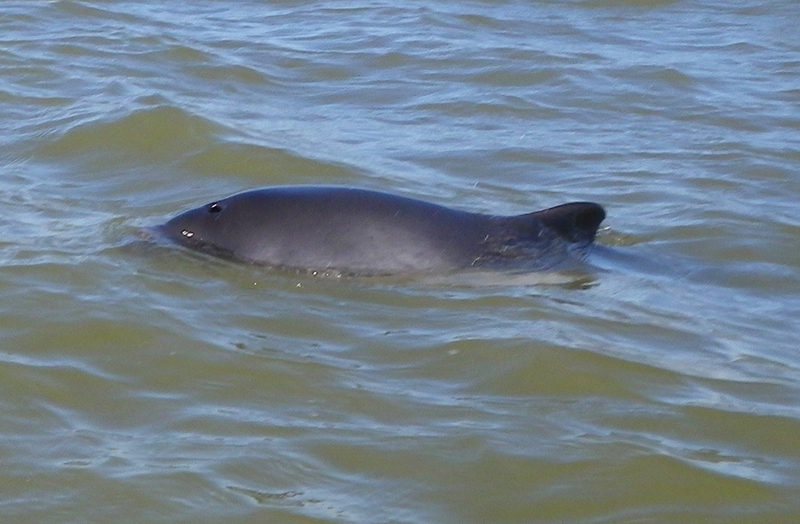 BTW those porpoises may have been off of Coney Island last season. I was speaking to lifeguards who had seen them and they seem to match the description you give. Thanks, Steve! Good to know about the porpoises. I’ve seen them around in previous years—usually pods of several, at several locations, once even off the West Side of Manhattan!—but have never gotten any photos before this trip. Great story! I love that little sliver of beach and have been scolded by a pedestrian, as I was climbing down from the bike path to collect flotsam on the shore below, informing me that it belongs to the army. Good to know security is no joke around there. Yes, if they don’t want us on it, why do they make it so darn attractive???? funny and riveting text! loved it Johna, especially the somewhat surprising fact at the end that every minute was a blast- you two are true adventurers! Thanks, Philip! I think “riveting text” is going to warm me for the next week, along with Marcia’s generous comment! And yes, that was the most surprising part of the whole experience–that it was minute-by-minute FUN! You are welcome—glad you liked it! You guys rock! What a story and adventure — and it was a blast — that’s great! I used to live in walking distance of the VN Bridge and rode the bike path lots. Looked at the beach and rocks and tho temped never climbed down. In fact most of the spots in your story are familiar to me except not from the water. So I was captivated to read that you did things I only day dreamed about. And as a man with prostate issues I always wonder where Kayakers go when the have to go — now I know one answer. So glad the cops ended up good guys in your story as well. I’m going to read this again tomorrow — I want to be sure I understand just where you were along the way. Thanks a bunch for writing in such detail — good writing tends to come from having something to write about — your adventure is a case in point. I know the feeling… I looked out onto the East River for many, many years wishing I could somehow get onto it, or into it.! I love the dear folks at Kokotat, but I really wish they’d figure out that “Farmer John” is not exactly the most effective design for the female anatomy.. happy to serve as an expert adviser on that one (my ‘expertise’ being of course possession of said female anatomy).. Anyway, thanks for reading, and commenting! We’re glad, too! And we look forward to paddling with you… in the summer. AIEEE! Ties my stomach in knots just reading this! Glad you made it home OK. Love the bit where the officer tells you ““Of course, if you were to launch from some OTHER pier, that’s none of our business…”. Great stuff. That little pocket beach under the Verranzano is a lifesaver – I’ve had a friend bail out there too. He hadn’t been feeling well when we launched; he’d hoped it would pass but it not only did it not pass, but he was going downhill fast (we suspect maybe food poisoning, it was that dramatic). We got there in broad daylight & were able to squeeze out through the gate (locked, but with a pretty loose chain) – it looked like somebody had a little fishing setup at the end of the pier so I guess we got the idea that there had to be a better way out than over the fence. Being a party of 4, and the kayak being a very light one, we were able to pass the boat & gear over the fence & we were able to reach Sebago’s Commodore, who agreed to come get our ailing paddler (God bless him!). The rest of us were able to paddle on. We weren’t challenged, but maybe the police are less wary of people doing stuff there on a hot summer day. Is good to know that it might not always be so straightforward. I think it was then that I first heard that the beach had been nicknamed “Bailout Beach” & maybe heard a vague version of this tale, or at least a similar one. Bonnie, I think you’re skinnier than I am. I used to be able to go through gate spokes but that stopped when I think I was 11 :-). Hadn’t heard “Bailout Beach” before but totally applicable! Sorry to hear about the meeting, but I’m very happy you found it so riveting! What a great adventure!!! I’m a NY nautical adventurer too! We’ve made a show about it and it’s premiering Fri 3/2. mMybe it will interest you and peers. Fantastic story! Thanks for the entertainment.